A multi awarded, popular Beach Hotel, in a privileged, unspoiled and quiet, seafront location in Protaras, amongst extensive grass lawns and beautiful well-kept gardens which run down to a safe beach with fine golden sand and crystal clear sea water, which has been awarded the blue flag. The rich variety of facilities, amenities and comforts on offer, the exceptional quality of our services, the excellent food, the friendly staff and fresh clean and warm family atmosphere that Cavo Maris Beach Hotel has, will make you realise that, on top of satisfying your design tastes and expectations, these are all you need for your Holidays to make them most enjoyable ones. 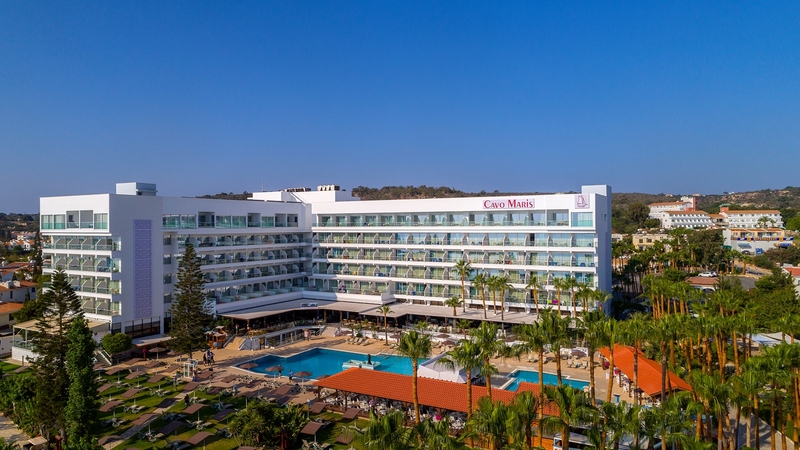 Here at The Cavo Maris Beach Hotel, we fully understand that expectations for such an event are very high. That is why we have created our Wedding Gazebo, the perfect setting for you to say those special words and to make your wedding unforgettable. Our Gazebo is set surrounded by our wonderful gardens, with the view of our crystal clear blue sea in a brilliant environment. Knowing very well how stressful it is to organize such an occasion, we are here to perfectly organize everything for you, to the slightest detail. Please note importantly that we hold no more than one wedding per day so that we can ensure our full dedication to the event! If you prefer something a little more private then, how about our indoor wedding venue in one of our elegant Meeting Rooms. Fully air-conditioned and beautifully decorated, we put your individual preferences with our own personal touch on what will be the most memorable day of your lives. Whether you would like a champagne reception or a cold finger buffet, nothing is too much for us. Our gazebo garden is perfect for having a drink and a light meal with your family and friends to toast the happy occasion. Our gardens set the scene for some wonderful photos to be taken. (Maximum Number of Guests is 70 depending on seating arrangements).